L 21" x W 21" x H 32"
Borrowing origins from the Roorkhee Chair, developed by the British Colonials in India, redesigned later as the Safari Chair by Kaare Klint in 1933, we designed the chair as a fashion object: a chair that transforms into a Tote bag- the sides and grips disassembling into the seat, back and armrests. Hang it on your wall or rest it by the couch, carrying it on your person when you step out of the house. It's as much a personal belonging as a piece of furniture. 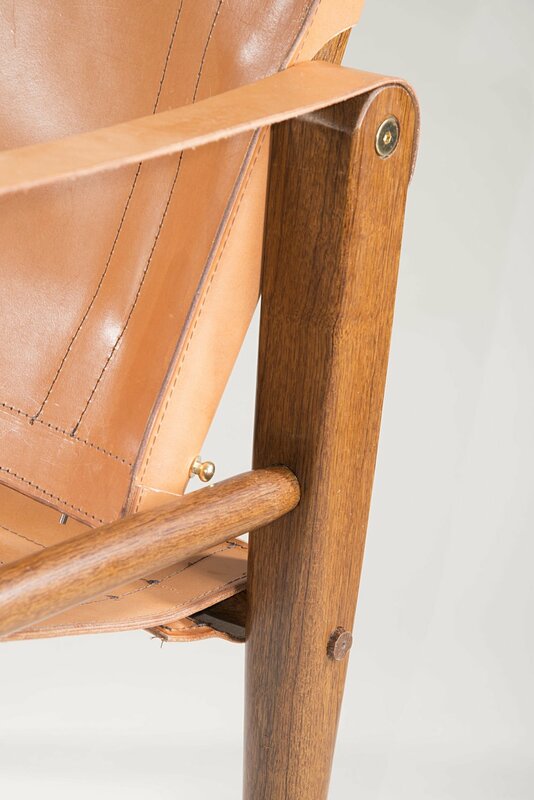 The chair starts life as a monochromatic pale cream, the beech matching the color of vegetable tanned leather. The surface records time, age and use- sunlight, wrinkles, wine stains and grimy edges- taking on a rich deep brown patina, alive and unique like its owner.